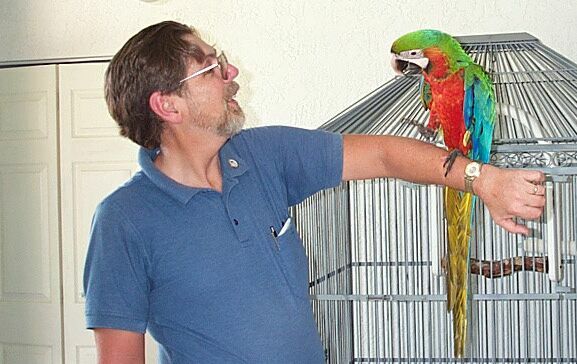 Kosh is a Harlequin Macaw. These are pictures of his first visit to our home. At 3 and 1/2 months, he is almost, but not quite weaned. His breeder, who owned the pet store where we bought him, suggested that we take him home for an hour or so for a first visit. The idea is to make the final move to our home an easier experience for the bird. Here is Kosh as I am about to introduce him to the family. The large cage in the background will be his new condo.